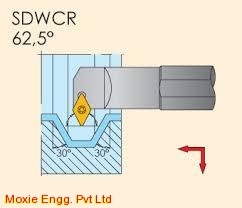 DCMT NEUTRAL BORING BARS :: ToolingBazaar.com - Buy CNC tools and accessories online. DCMT NEUTRAL boring bars are used to inner grooving and 55 degree threading applications. It generates less cutting forces and are very effecting in generation of grooves.